Beautiful runner. Love it. Unfortunately, I should have ordered a longer one for the area I want to use it. Great price. Richly colored and beautifully detailed, this traditional rug draws inspiration from Persian and European designs. This rug features a main color field of red with an ivory border with beige and green accents. With a power-loomed construction and polypropylene fibers, this rug is virtually non-shedding for easy care. Safavieh allows you to decorate with classic designs at a comfortable price point. I use this rug at my entry way, and it fits the area perfectly. The color is a lovely red that is very welcoming! Just the perfect size I needed. Colors look exactly like photo. Rug is exactly as described in listing. Will definitely order more rugs from overstock. The rug is being used in our bathroom. The color,length,and style look so much better than the picture. Also, it is super easy to clean. I absolutely love it. There was not anything that I ordered from Overstock.com that I did not like. Upon receiving my packages, I am amazed at the high quality of the furniture and rugs at such good prices. No one believes me when I tell them how much I spent redesigning the interior of my home. I recommend Overstock.com to all of my acquaintances. Thank You, for your excellent service and deals. This is a great rug,Very attractive, and I would buy this again. I bought a set of these rugs in varied sizes to bring rich color to my floor plan in entry, hallway, living room and dining room. They are great! Wear well, hides a multitude of sins and cleans up well! I was looking forever for one of these inexpensive runners and kept checking discount stores nearby till I thought to check online and there was the one I want in an unusual size at a bargain price. The $2.99 shipping clinched the purchase -- normally, they'd charge you a fortune even for a small rug, but it came quickly, well-packaged, and for an unheard of shipping price. I'm very pleased and now check Overstock anytime I'm looking for anything because if they have it, it's likely to be the best price. Colors are true to photos. Very thin Rug but will protect my flooring where I've placed it. Price was good considering how thin these are. I put this rug in front of my double vanity in the bathroom and the rug looks amazing. The colors are beautiful and rich looking. The room is elegant looking now. The rug quality is outstanding! This is my third Safavieh rug purchase. They stay soft, lush, and with bright colors for a long time. Happy with this for the entryway to my garage—looks lovely! I love the colors and I needed the oriental print for diversity and accent in my hallway. Nice , lasting long , Beautiful colors ! nice, nothing stunning about the rug. This runner is just the right "Red" next to our bed. Just the right length & width. I love the colors (excellent for the furniture & colors I have) & perfect size for my dining room as I just had the original wood refinished in my home. Did not want rug/carpeting under table. Love these rugs. I have them throughout the house. Durable, look great! Good buy for the price. "Who pays return shipping cost is I am not satisfied with the rug?" To coordinate and carry theme to kitchen area from family room seating area. I have two other of the same design and I am extremely happy with them! 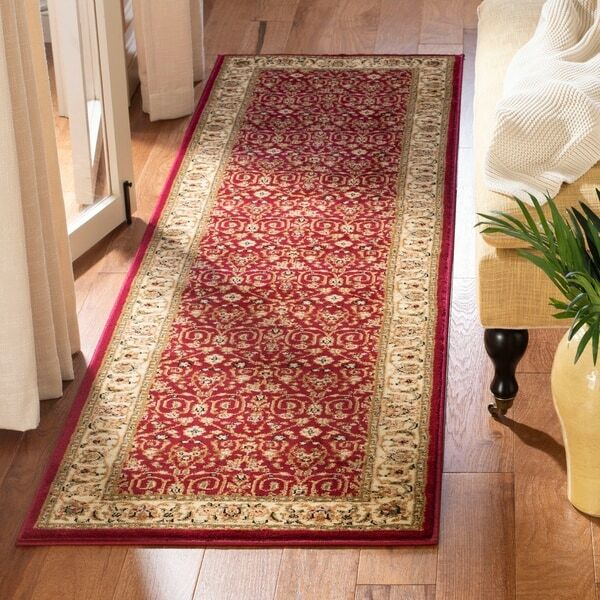 Safavieh Lyndhurst Traditional Oriental Red/ Ivory Rug - 3'3" x 5'3"